The restoration of the Philips Roe house has overcome a number of hurdles over the past couple of years, including multiple relocations and asbestos abatement. 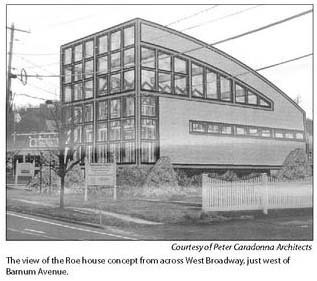 Now, thanks to the vision of architect Peter Caradonna and the tenacity of the roe house committee, the project is ready to enter the final stages. 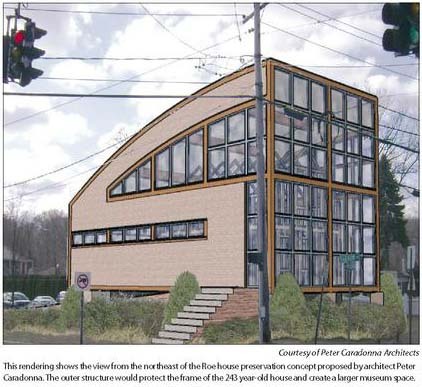 Caradonna's concept, called "exceptionally dramatic" by trustee Barbara Ransome, who heads the committee, was unveiled at the village board work session Monday. A public presentation is scheduled for April 7 at the village board meeting. Ransome said the entire committee, which was well represented at Monday's work session, supported Caradonna's basic concept, although she admitted there has been some initial resistance. Ransome explained that upon completion late last year of the asbestos abatement, it was determined that the original frame had suffered insect and moisture damage, and would not be able to support any future structure. Thus was the committee faced with the decision either to "knock it down or do a cutting edge preservation." Caradonna said the 18th century frame, while "pretty much intact," cannot be certified as safe as is, and you "couldn't have people walking up to the second floor." his design concept calls for a largely transparent shell structure to preserve and display the 18th century timbers, which frame the roe house, while creating a larger interior space for exhibits, with room to accommodate groups of up to about 30 persons. The concept also "compares and contrasts 18th versus 21st century" construction. Caradonna said. His design could be certified as a LEED (leadership in energy and environmental design) building and, although the energy configuration details have not yet been fully explored, Caradonna said the energy efficiency of the design, including low-flow bathroom fixtures, rainwater capture and the possibility of geothermal or solar "will offset operating costs." The structure, 32 feet at its highest, would become and instant "icon," visible from the harbor and from different parts of the village, according to committee members and the architect. Condominiums currently under consideration for property along west Broadway now occupied by the new heritage inn and islander boat center would likely block any view of the roe house from the west in the future, it was conceded. Barnum avenue resident Ken Gaul, a committee member who also donated $25,000 toward the project, said the green aspects of the design would bring down operating costs borne by the village. Gaul admitted it was "an iffy shape" for a village known for its gables, but spoke in favor of the design. 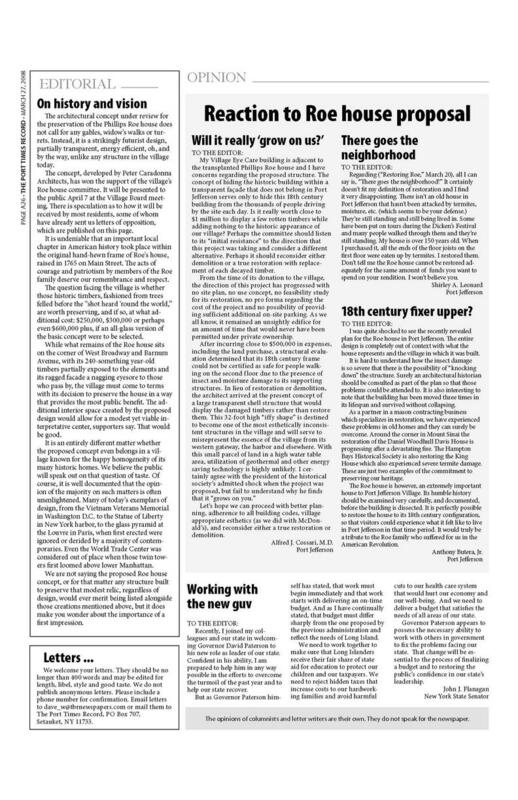 Nick Acampora, president of the historical society, admitted "initially there was a little shock," but agreed with the other committee members that the design "grows on you." Acampora stressed the value of keeping "a tangible link" to the past in the form of the roe house itself, and said the outer building would provide space for the planned interpretive center, which would inform visitors of the history "these walls" have witnessed. Ransome said the center would likely be opened during the season and on weekends and other high traffic times like during the dickens festival, and possibly staffed by volunteer docents, the transparent outer building would still allow passersby to view the historic structure even when it was closed.These days, Ransome said, if you want to drag kids to a museum, your destination "has to be gutsy" and have "more glamour." Mayor Brian Hartly called the concept "a very good idea," although he was interested in what a completely glass outer structure would look like. That option had not been pursued, as it would more than double the price tag, which at about $300,000 is already some $50,000 over budget. Ransome was sanguine that the design, especially because of its energy efficient aspects, would attract additional grants. Caradonna said his preliminary concept could be amended to incorporate specific design changes.